Old Market Poet Britny Cordera Doane: A Writer’s Workshop success story. This was going to be a rallying piece intended to garner support for a Kickstarter campaign, but instead it is my great pleasure to have turned this into a success story piece. Britny Cordera Doane is known as “The Old Market Poet.” She is often found typing poetry on an old analog typewriter in Omaha’s Old Market district. She is currently attending The University of Nebraska at Omaha as a religious studies and poetry major with an ancient Mediterranean studies minor. 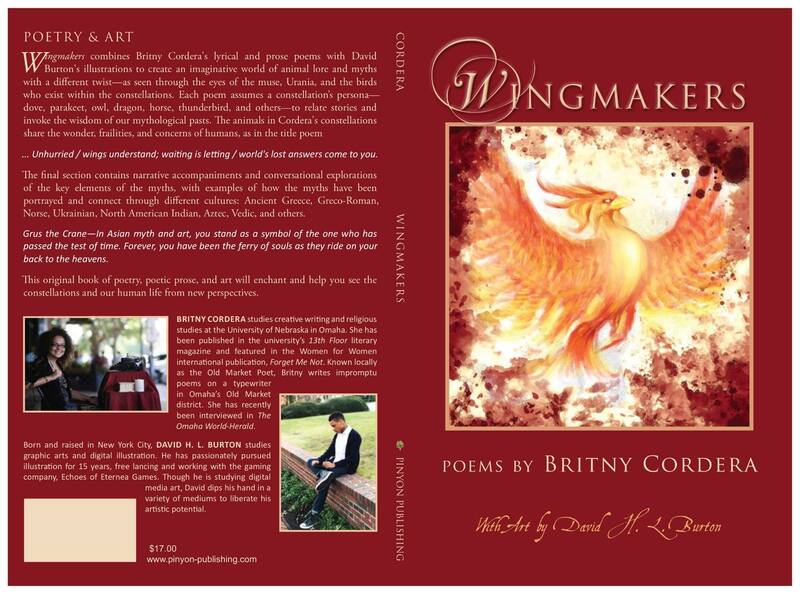 Doane’s book of poetry “Wingmakers” was recently accepted by the small but prestigious Pinyon Publishing due to release early March of 2015. She is running a Kickstarter fundraising event to get funds to buy author copies to sell locally and at author events. The book will include original illustrations by David HL Burton. With more than five days to go, Doane achieved and exceeded her fundraising goal of $1,000. The event will end February 6th, so don’t miss your chance to participate in funding this worthwhile project. Doane sat down with 13th Floor Magazine staff to discuss her experience getting her book published. Q: Describe your process for selecting publishing companies to query with your book. A: I started going around to local bookstores specifically looking for books of poetry by local authors, and I took notes of the publishing houses they were published under. Many of the publishing companies had websites so I could see if my writing, particularly for “Wingmakers,” would best fit what they were looking for. I decided to go with Pinyon Publishing because [Writer’s Workshop department chair] Lisa Sandlin introduced me to them with her amazing book “You Who Make the Sky Bend.” And I knew [Writer’s Workshop faculty] Miles Wagner also had a book published by them. When I checked out their website the type of books they were publishing were right down my alley. Q: Once accepted, what was the process like for preparing your book for publication? A: “Wingmakers” was edited a total of five times. Once or twice by me, once by my dear friend and incredible writer himself, DJ Carlile, and then a few times with Gary and Susan, the owners and head editors of Pinyon. When the full manuscript was sent to them and accepted, they made the editing process very smooth for me. They didn’t ask for many changes and all changes that were made, were approved by me ahead of time. We worked together really well; thoroughly, but also swiftly. I fell in love with the cover as soon as I saw it. Q: How did you choose kickstarter to obtain funding for your project? A: My friend, Sophia, has a non-profit strings ensemble, who did her own fundraising to make her dreams come true. She helped and inspired me to go with Kickstarter to help fund my book. I wanted to do grants, but the grant writing process took too much time, was too complicated, and there were too many grants I couldn’t apply for because of how specific they were. Plus there are so many successful publishing campaigns on Kickstarter. Q: How will you use the money you get from Kickstarter? A: I am hoping to buy 50-75 (maybe less, maybe more) copies of “Wingmakers” upfront, to sell (give as rewards to those who have donated), distribute to review journals, and different poetry awards. Then the rest I would like to pay my illustrator, go to writing conferences and workshops, and setup book readings, and signings, locally and possibly out of state. Q: What have you learned from the publishing process so far that you think other newcomers might appreciate knowing? A: When it comes to publishing, whether it be a book or individual pieces, do it often and don’t let fear of rejection get in the way of amazing opportunities. From my experience, I have learned that it is also important to really pay attention to what the editors of literary magazines or publishing companies are looking for. Actually read the books they publish and the literary magazines or reviews they come out with. Though most publishing companies and literary magazines or reviews are not genre specific, they have a good idea of what they are looking for in a poem or a piece of fiction. Lastly, if you have a manuscript ready to be sent to a publisher, send it to them over the summer. When my book was accepted in July or August of 2014, literally that same day I read an article that said to send your books to publishers over the summer. Their reasoning was that during the summer people aren’t sending in manuscripts because most people are on vacation, not writing or submitting anything. I can definitely attest to this being true as my book was accepted during the summer. Q: Where do you draw your inspiration for your writing? 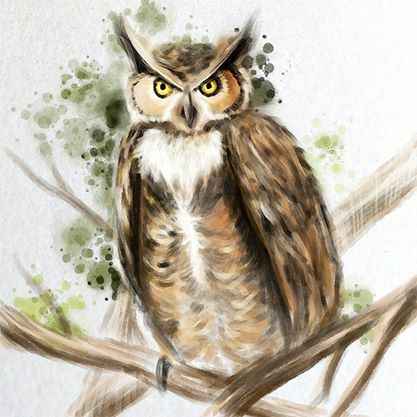 A: For “Wingmakers” in particular, I was inspired by a owl late at night hooting as loud as he could. A desire to write a book was brewing in me for a while, and I was always told: “write what you know.” For the longest time I really didn’t know what to write, but that night I figured it out. I wrote about what I knew and that consisted of ancient world mythologies, combined with my love for birds. I still draw my inspiration from world myths, but now a days I am working on being inspired by any and everything. ← Spring 2015 Issue is Available!